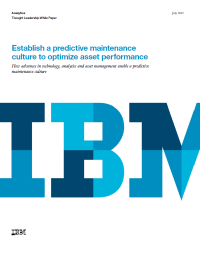 Download this white paper as it explores changes in asset instrumentation, communications and analytics that have opened the door to a culture of predictive maintenance, what that culture can do for your organization, and how you can overcome the obstacles to creating such a culture. Many organizations may not regard maintenance practices as a primary means for optimizing asset performance. While operations managers look for ways to reduce maintenance costs, most simply — and perhaps grudgingly — enter these costs into their accounts. Financial pressures and production schedules prevent the evaluation and adoption of more effective maintenance practices that managers could leverage for business advantage. But in recent years, operating environments have been changing. In fact, an increasingly connected world facilitated by the Internet of Things — all manner of equipment embedded with sensors and intelligence — is changing maintenance practices. Sophisticated analytics and modeling technologies can now be applied to the operational data generated by this equipment to help predict the need for maintenance. The challenge organizations now face is to convince executives, along with operations and maintenance personnel to overcome any cultural resistance to change.